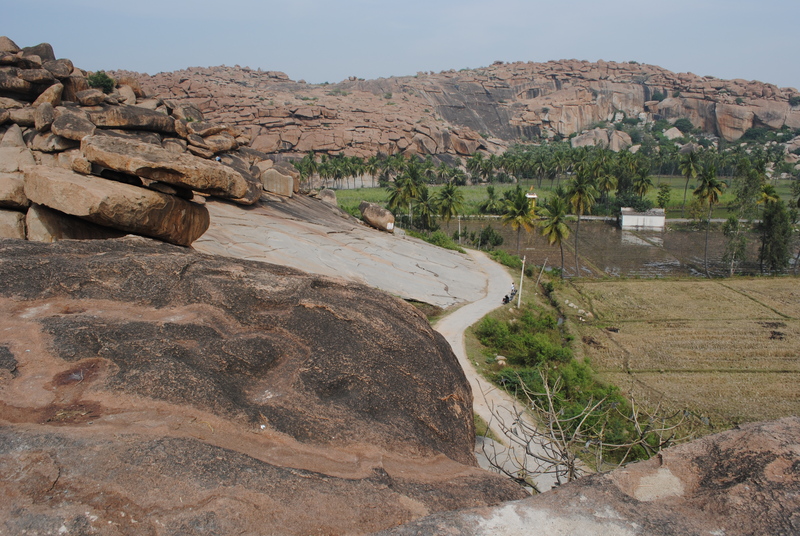 Several months after the monsoon the landscape of Hampi is desolate and other-worldly. Save the glowing green rice paddies and banana plantations thriving in well irrigated valleys, the occasional stunted scrub tree and patches of dried grass, everywhere is naked stone; boulder upon smooth, worn boulder, many larger than the vehicles and buildings, baked reddish brown like clay from a kiln. Some pile one atop the other like ancient pyramids hundreds of feet high and veiled by a gossamer of dusty haze. Others lie in solitude, scattered across riverbeds and countryside, or amongst the boxy whitewashed buildings, sheet metal shacks, and palm-thatched huts of the villages. Often they balance in the most perplexing, gravity defying manner as if absent mindedly discarded there by some mighty, but hurried god. The landscape leaves one all at once awestruck and miniscule. Its mystical terrain is fantastic and inspiring. It helped inspire an epic and was a catalyst for one of Hindu’s greatest civilizations. 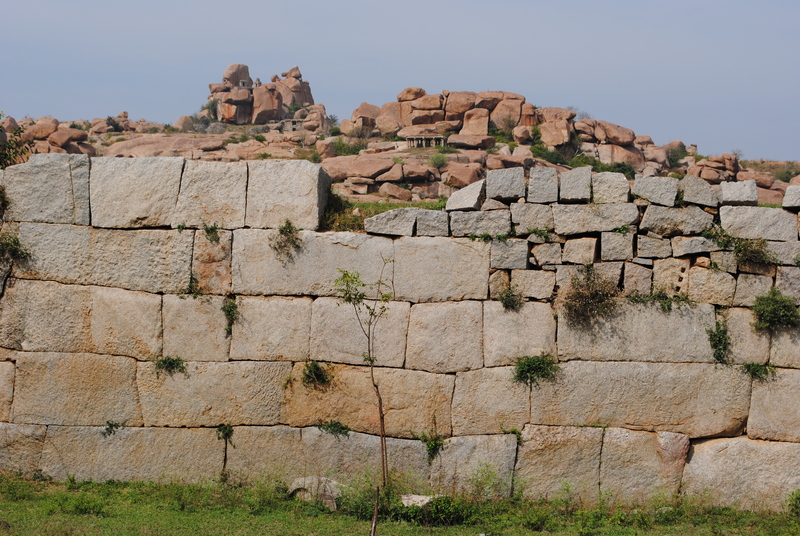 The monkey god Hanuman hails from Hampi and in The Ramayama, one of Hindu’s defining tales, his monkey army uses these stones to build Rama a bridge to Sri Lanka to rescue his wife Sita from the demon Ravanna. 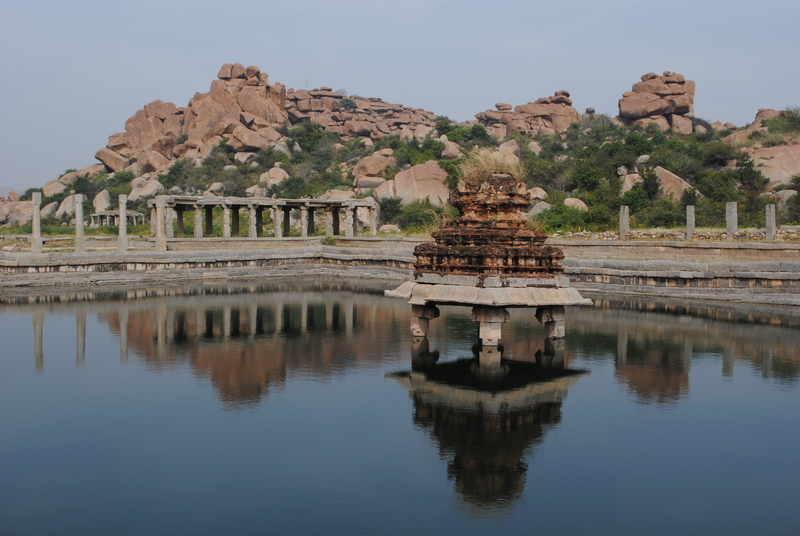 In the 14th century, its phantasmagoric landscape and prominent place in Hindu mythology would Inspire Prince Hariharaya to choose the area as the site for his new capital Vijayanger. Over the proceeding two centuries the city would attain greatness as an international center of commerce, home to half a million people at a time when the population of Paris was half that and London had a scant 50,000 inhabitants. Its main bazar, lined with granite columns, stretched over two kilometers and bustled with foreign and local merchants trading everything from precious stones to horses. The holy location also made it a site of pilgrimage and the prince had hundreds of elaborate temples masterfully carved and crafted from the area’s bountiful supply of stone. In a feat of architectural genius each granite block of their walls fit precisely against the next leaving no gap, despite the fact that there are no right angles and the oblique, vivisecting cracks curve in an uneven grid. The temples and shrines inside are artfully chiseled into busts and reliefs telling Hindu tales, the empire’s history, and details of day to day life within the city. The most magnificent of those, the Vittala Temple, may contain one of the world’s largest musical instruments. The 56 solid granite columns of the sprawling dance hall are divided into two posts of different thickness and length so that when beat with wooden sticks each produces its own unique tone. In the golden age of King Krisna Devearaya musicians would beat them simultaneously as the queen danced hidden behind a silk veil. Despite the capital’s abrupt downfall at the hands of the Islamic Mughals in 1565, much of its splendor remains at least partially intact. 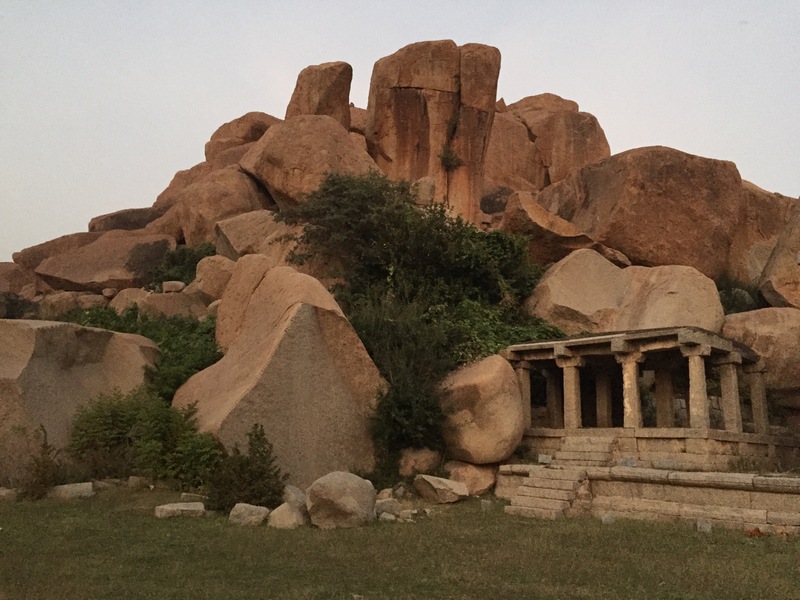 Thousands of worn granite walls, columns, shrines, and pyramidal temples remain centuries later scattered across the countryside like miniature projections of the hills and boulders encircling them. 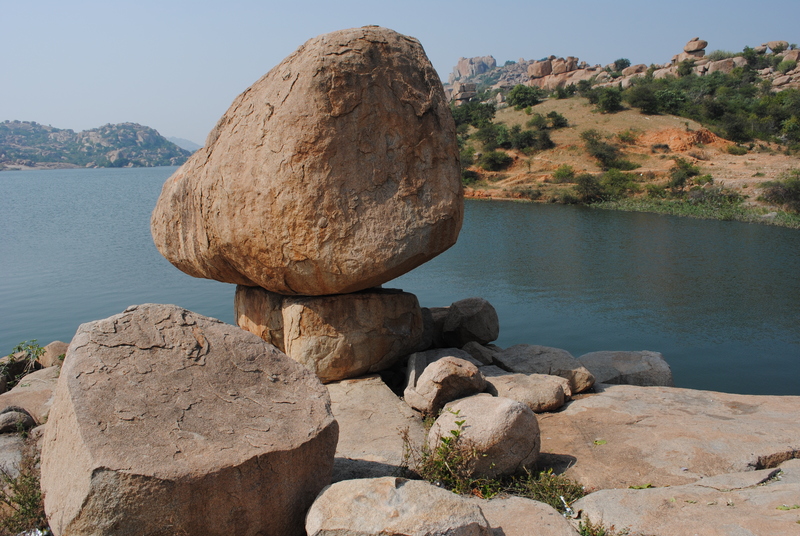 Nor has Hampi’s spiritual ardor and traditional culture relinquished. 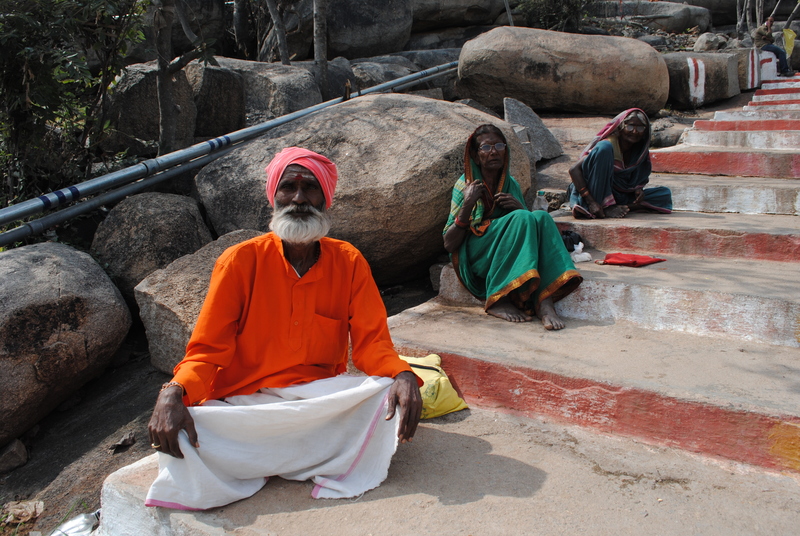 The pious still flock to the temples to give alms to shrines of Shiva and Vishnu and receive blessing from the Brahman priests. 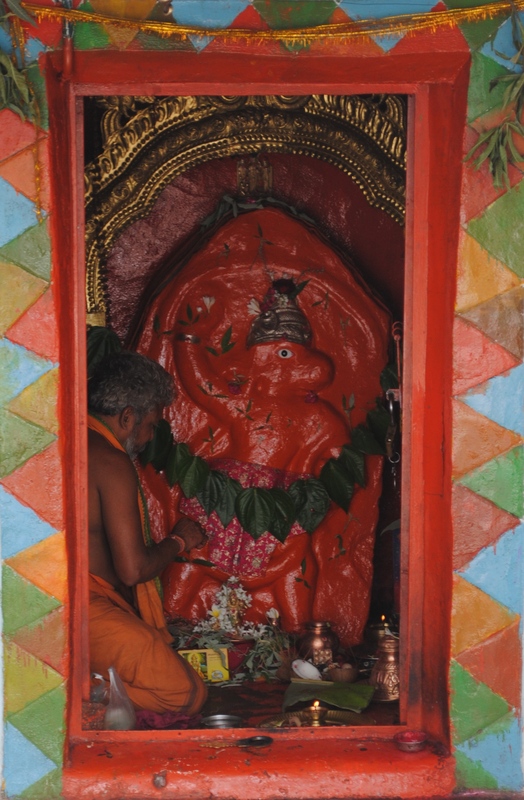 Each morning, the holy elephant Lakshmi is tenderly bathed in the Tungabhadra River separating the bazar from Virupapur Gaddi popularily known as Hampi Island and chakras are painted down her trunk before she returns to Virupaksha temple. 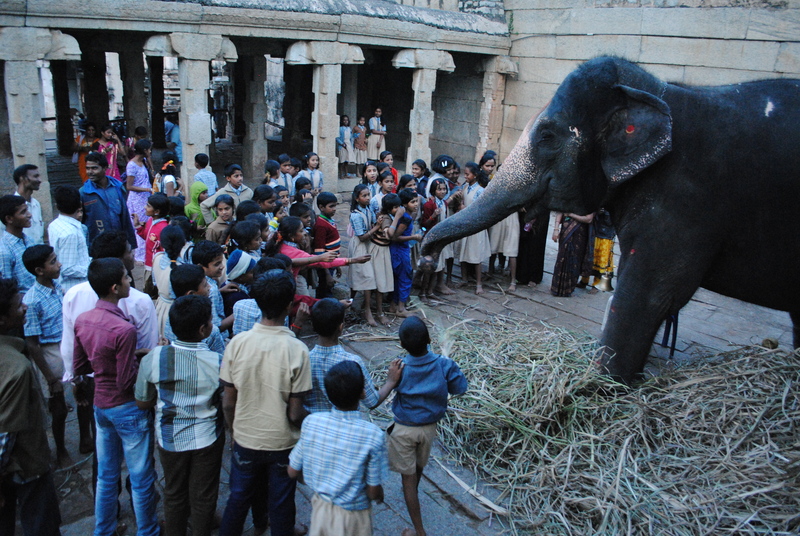 Here children will giggle and feed her peanuts while their parents pay the elephant their respects. 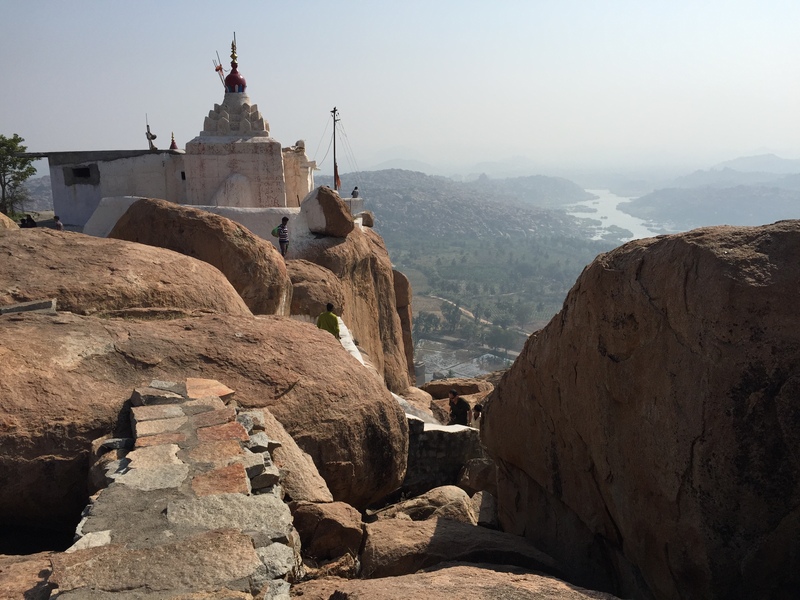 After trudging up 570 steps to the soaring Hanuman temple, one can sit on the warm rocks drinking in the panoramic views and listen to the sonorous chants reverberating across the valley from numerous temples far below. Yet it’s easy to forget about the other tourists when you lose yourself in the unending boulder-strewn hills and valleys or find yourself alone in some small forgotten ruin. Even around the bazaar, the uniqueness of the place and spiritual nature of the people outshines everything else. 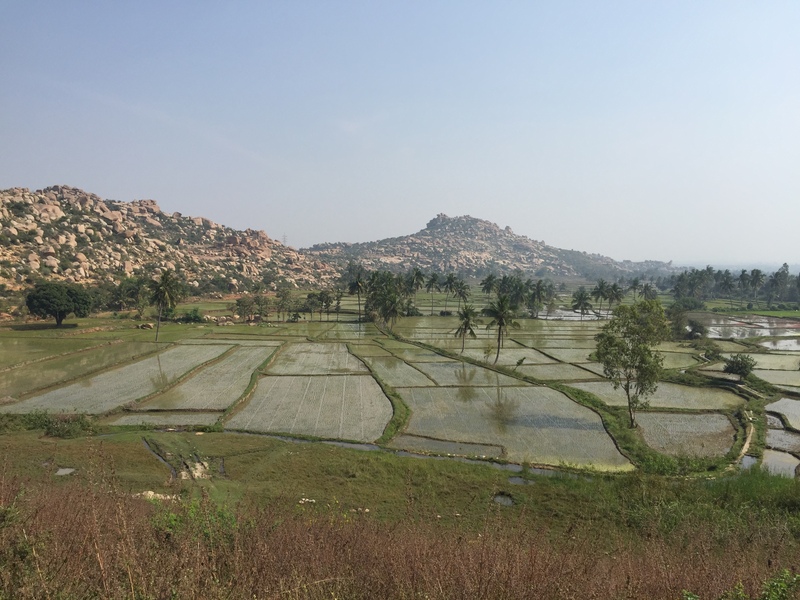 And when dusk settles over Hampi, as the tour buses pull away and the travelers head back across the river to their guesthouses, a peacefulness settles over the village. 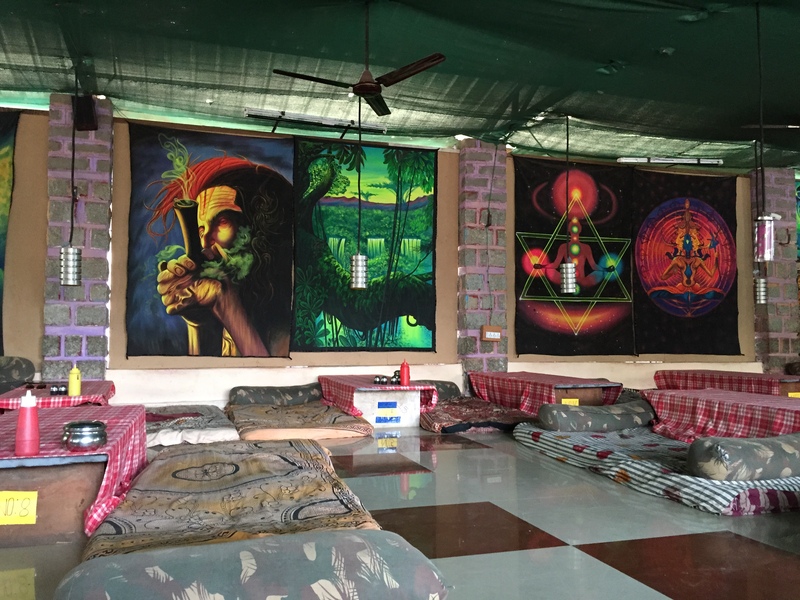 The Karnataka gypsy women with pierced nostrils, silver bangled limbs, and red, purple skirts studded with tiny mirrors reflecting glimmers of the last of the crestfallen sun, pack up their blankets spread with sparkling crafts. Shirtless men in a spotless white dhoti return from an evening bath in the ghats below, while the holy cows with big placid eyes wander languidly through the streets ambling from one kolam to the next, smudging the remains of the intricate chalk patterns women in South India draw under their doorways each morning as a sign of welcome to gods and guests alike as well as to ward off evil spirits. 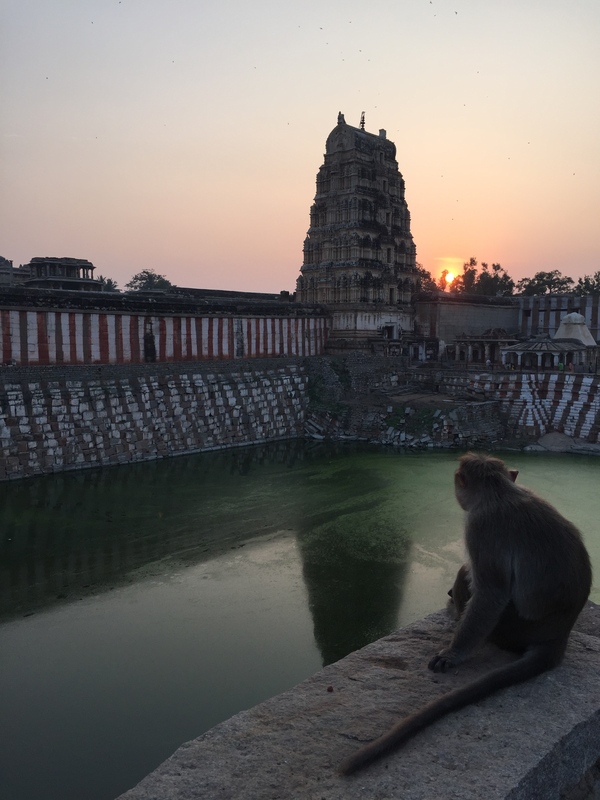 It is in these quite, subtle scenes, as the setting sun fades the from red to a dull purple, that Hampi’s timeless beauty shines through, the sun not yet set on this eternal holy site.